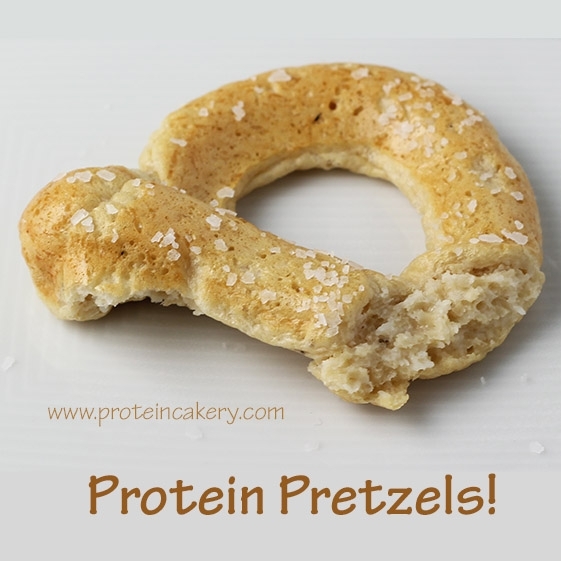 Soft, doughy, New York City style protein pretzels! Great with salt or spicy mustard! 2. Mix all ingredients, and let the batter sit for 10 minutes to thicken up. 3. Pour the batter into a large ziplock bag (or piping bag), and twist the top to keep the batter in place. Cut off one corner of the ziplock bag. 4. Pipe the batter into a greased (with coconut oil or non-stick cooking spray) pretzel pan or onto a parchment-lined baking sheet. 5. Bake for about 8 minutes, until firm. 6. Remove from baking pan, and sprinkle with coarse salt (optional).